Healthcare organizations are increasingly sensitive to cost control and productivity. A healthcare resume must reflect an understanding of these changes. It must show evidence of skills, experience, commitment to quality and an ability to evaluate yourself. 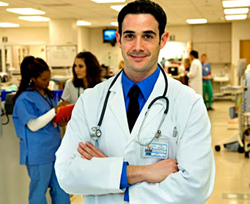 The healthcare professional should list all credentials, but not necessarily boast about the achievements. Typical headings in a healthcare resume include education/degrees, internships, professional experience, awards and honors, publications (books, articles, reports, journals), speaking engagements, conferences and professional affiliations. Your healthcare resume must include a short and specific statement specifying your goal that includes position, industry and/or relevant skills. For example: Position as a Nurse of Health Care Provider. Health care professional with medical degree and hospital experience, combined with M.B.A. in Health Administration. Proven ability to organize a health care facility. Recognized for ability to work with very diverse clients and staff. Outstanding skills in assessing what is needed, recommending sensible solutions, and effectively motivating staff to implement them in a spirit of collaboration. Education : List the highest degree first. Describe your skills using job related keywords. For example, Computer/Tech skills like software and program expertise, especially if it is related to healthcare. Your technical skills can be listed in a separate Technical Summary section or within the context of another achievement. For example, 'developed and implemented patient status/tracking system using MS Access'. Activities : Campus and community activities; Memberships in professional organizations. Education/degrees, internships, professional experience, awards and honors, publications (books, articles, reports, journals), speaking engagements, conferences and professional affiliations. Include software and program expertise, if it is related to healthcare. Your technical skills can be listed in a separate Technical Summary section or within the context of another achievement. For example, 'developed and implemented patient status/tracking system using MS Access'. Show your clinical skills as well as any other administrative or managerial skills you have. Highlight your accomplishments and unusual experiences. It's not necessary to detail your daily duties. If you did the same job at multiple hospitals, there's no need to list every single one. Put them all under one heading and describe your duties. List pertinent education, but not necessarily every conference you've attended. Include experiences you've had other than in the healthcare field. This will help show your diversity.